Pac-12 South race is far from over, but the Utes have enough worries of their own. (AP Photo/Rick Scuteri) Utah quarterback Tyler Huntley (1) runs away from Arizona State defenders in the first half during an NCAA college football game Saturday in Tempe, Ariz.
Tempe, Ariz. • Utah’s resounding victory over UCLA to conclude October naturally played into a theme of the Utes' coming back to the Rose Bowl in January as Pac-12 champions. The Utes' 38-20 loss at Arizona State and junior quarterback Tyler Huntley's season-ending collarbone injury Saturday created another potential return trip in December, amid the reality that the Cheez-It Bowl in Phoenix doesn't come with a parade. The sequence of events that ended their QB’s year, their four-game winning streak and their command of the Pac-12 South race left the Utes facing two major questions: How big is the drop-off from Huntley to Jason Shelley? How far could Utah fall in the Pac-12′s bowl structure? The answers will come soon enough for the Utes, who fell out of the AP Top 25 this week. Utah (6-3, 4-3 Pac-12) finishes the regular season with conference games Saturday vs. Oregon and Nov. 17 at Colorado, followed by BYU’s visit Nov. 24. No, it’s not. Utah needs two wins, plus help from one of Arizona State’s opponents: UCLA, Oregon or Arizona. The bigger issue is whether the Utes can regroup sufficiently behind Shelley. ESPN’s Football Power Index gives Utah a 75 percent chance of winning each conference game, but those calculations are based on past performance, not considering any team’s personnel. Shelley replaced Huntley late in the third quarter and led a drive to a field goal that made it 21-20, but then he directed two three-and-out series as ASU took control. He had appeared in three previous games, never with the outcome in doubt. Utah is bowl-eligible. But if the Utes end up 4-5 in conference play, they would fall into the Pac-12′s lower tier of bowls. That would be a big letdown, and that’s why this month will be even more fascinating than Utah’s past Novembers. • Zack Moss will be needed more than ever. In what seems likely to be his last college season, the junior running back is nearing 1,100 yards and remains on track to break Utah’s season and career rushing records. He’ll be especially vital this month, with an inexperienced quarterback. The challenge for Moss and Utah’s offensive line is that defenses will be geared to stop him, to an even greater degree. • Utah’s secondary was disappointing. 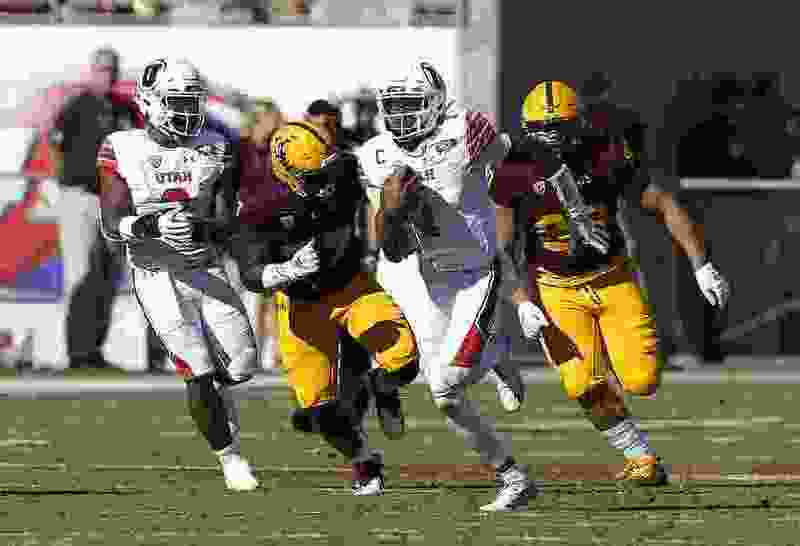 Whittingham was more critical of Utah’s run-stopping failures, and it’s true there’s no other Pac-12 receiver like ASU’s N’Keal Harry. Yet the Sun Devils' passing game was far too effective against a Ute secondary that wants to be known as the best in school history. Manny Wilkins went 19 of 24 for 285 yards with one interception (Jaylon Johnson’s third of the season) and ASU had two 100-yard receivers. • The November curse is real. The late-season chill struck Utah on a 79-degree afternoon. The Utes' Pac-12 winning percentage is historically about the same in October, but Huntley’s injury fits the perception that bad things happen to this program in November. And subtracting five wins over last-place Colorado teams, Utah is 8-14 in November in the Pac-12 era. Harry. He's a reminder that talent wins in these competitions. Harry caught nine passes for 161 yards and three touchdowns, and seemingly was there whenever ASU needed him. Harry's 61-yard touchdown catch on the first play of the fourth quarter. Even with Huntley sidelined, the Utes had a chance, trailing 21-20. But Harry caught a pass over the middle and weaved to the end zone in just the kind of game-changing play that Utah's coaches feared he would make. Runner-up: Huntley’s 5-yard TD pass to Samson Nacua, giving Utah a 17-14 lead after having trailed 14-0. Huntley showed good touch, with Nacua wide open. The sadness is twofold, though: The Utes' only lead of the game was temporary, and that pass will stand as Huntley’s last touchdown of the season. Utah’s passing game was not sharp Saturday, but Huntley deserves credit for a memorable October. Senior center Lo Falemaka returned as a reserve after a missing all of October with a leg injury. Junior linebacker Francis Bernard got his most playing time of the season and was involved in five tackles, including a solo tackle for loss. Once ranked No. 12 in the AP Top 25 after beating Washington, Oregon (6-3, 3-3) has faded. But the Ducks topped UCLA 42-21 on Saturday and have a quarterback-receiver tandem that should trouble Utah. Dillon Mitchell caught eight of Justin Herbert’s passes for 156 yards. The encouraging part for Utah is Oregon gave up 161 yards rushing to UCLA’s Joshua Kelley.